on June 21, 2017 by JA Europe and Nokia. What is STEM Innovation Camp? The Science, Technology, Engineering and Math (STEM) Innovation Camp is an initiative developed through a partnership between Nokia and JA Worldwide. 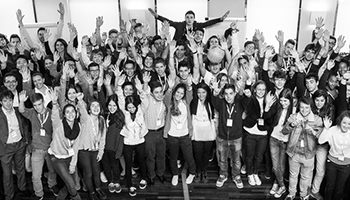 The STEM Innovation Camp is a one to two-day intensive experience for students aged 15-18 which develops their idea-generation and collaboration techniques. 5 JA organizations from Finland, Israel, Spain and United States (Chicago and New Jersey) are organizing Science, Technology, Engineering and Math (STEM) Innovation Camps during April and May. The national winners will participate at the Global On-Line Finals. The winning team from each country will compete against the others in an online global competition organized by JA Europe on June 21, 2017. Each national winner will solve the challenge and submit the ideas in the form of a presentation, with a 2 min video pitch online and a concept paper describing their team and solution. © 2017 Junior Achievement Europe. All Rights Reserved.